Put on your funny conductor hats, ODeck, as we look in to the religious symbolism behind one of Final Fantasy's lesser known, but still freaking AWESOME summons; The simply named Doomtrain! Oh just look at that beauty up there! That's primo A+ nightmare fuel right there. To date, Doomtrain has only had a minor appearance in one Final Fantasy title, the much loved / much hated Final Fantasy VIII. When summoned, Doomtrain attacks an enemy with Runaway Train, causing Poison-based damage with a possibility of inflicting several status ailments. Now, you're asking me, "Chrono, how can a train have religious symbolism behind it?" Well, to help answer that, let's first take a look at how exactly we obtain Doomtrain in the game. In Disc 3, Squall and the party reach an area called Tears' Point, where they can find a key item called Solomon's Ring at the foot of a giant statue. 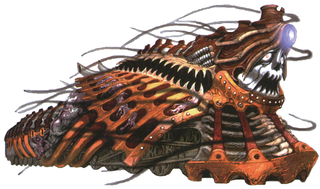 If used with 6 Remedy+'s, 6 Steel Pipes, and 6 Malboro Tentacles in their inventory, Doomtrain is summoned and becomes a Guardian Force (the summons of FFVIII). Now I hope you noticed a couple of key things in that paragraph. First, we have the fact that it takes 3 items, counting 6 apiece to summon him. Put it together, and what do we have? 666, commonly referred to as the mark of the beast. Second, we have the item Solomon's Ring. Obviously, this is in reference to Solomon the Wise, third King of Israel as told in the Books of Kings. But why would a ring bearing Solomon's name summon such a hellish creation? For that, we look at Doomtrain's Japanese name, Glasya-Labolas. In Demonology, Glasya-Labolas (depicted as a dog with griffin wings) is the name of a powerful Earl of Hell, who commands 36 legions of demons. He appears in one of the most popular books of Demonology, The Lesser Key of Solomon, which contains detailed descriptions of numerous spirits (including 72 demons such as Glasya-Labolas) and the ways to summon them and bind them to do the summoners will. While claiming to be written by Solomon himself, the book includes titles not in use at the time of Solomon's life, such as Earl and Marquis, as well as references to Jesus and the Holy Trinity, whom Solomon himself predates by about a millennium. So what are the similarities between Doomtrain and his (Japanese) name sake? Well, remember, when Doomtrain is summoned he poisons his enemy and inflicts a number of other detrimental status effects. Glasya-Labolas is described in The Lesser Key of Solomon as, among other things, knowing "all sciences". Now, as we all know, "science" can easily be used to do and make all sorts of things that are just horrible for us. I think a little poisoning and blinding and silencing would be a piece of cake. Plus, of course, The Lesser Key of Solomon is basically a how-to guide on summoning demons and making them do your wishes. Isn't that basically what we do with Doomtrain? Since he's a train instead of a dog with griffin wings, obviously Final Fantasy FAILED to correctly portray his real-life counter-part, no matter the similarities, right?! Yes, obviously Doomtrain is a train. But WHY is he a train? That's the important thing here. Well, me and many other Final Fantasy fans (including my buddy Balmut) couldn't help but notice Doomtrain's numerous similarities to an old Final Fantasy boss, one who is still loved by many. This is Phantom Train, from Final Fantasy VI. He is a sentient, undead train. As ridiculous as those string of words I just typed are, it's nothing compared to what you can do to it in the game. As demonstrated in the video above, it is possible for Sabin, badass of badasses, to actually grab the train, jump who knows how many feet in the air, and then throw it back down to Earth (which I didn't find out about until much later because I had to be a smarty the first time I played and just threw a phoenix down at it). So I think whats obvious is obvious when comparing the two, (phantom-demon, train-train) but something else of note is the fact that they both share the ability to inflict status aliments on their enemies. And while the connection has never been "confirmed", I don't think it's too much of a stretch. So in conclusion, while Doomtrain fails to be a faithful interpretation of his real-life namesake, the combination of mythology, nostalgia, and the pure AWESOME factor of summoning a demonic train of all things gives Doomtrain a big fat PASS in my book.